A Go-Bag or Bug-Out Bag originally refered to a backpack containing enough supplies to survive for up to 72 hours. In the event of a disaster, you would have everything you need already packed and ready to go, or at least near at hand. A more friendly use of the term go-bag includes a kit of materials and supplies for a particular job or event, like a student’s bag, a camera bag, or a bag packed for a weekend getaway. Read this Life-Hacker article about some very cool go-bags. 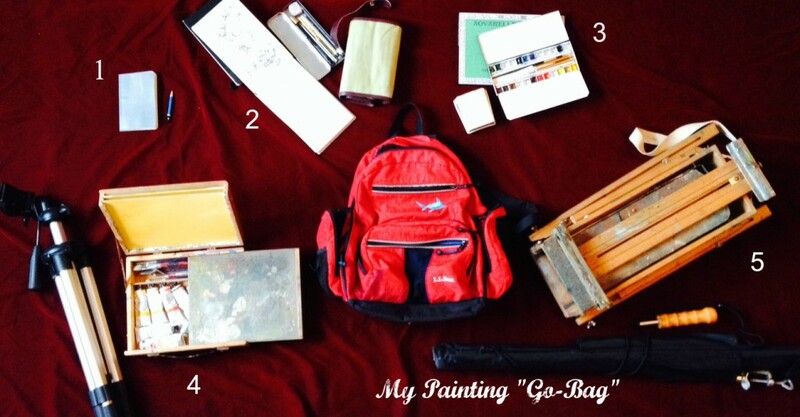 I have several painting go-bags, depending on how I travel. At the very least, whenever I leave the house I carry in my pocket a small sketchbook with a pencil stub (#1 in the upper left). For a slightly longer trip with a day pack I might add a larger sketchbook, with a small tin pencil box so I can carry ink pens, or roll-up pencil carrier (#2 in the top center). If I’m still travelling light but want some color I take a watercolor box and a block of Arches paper (#3, upper right). Things become more complicated with airplane travel. In addition to the items in #2, I carry a small pochade box with oil paints and palette knives. These would not pass through security so they go in checked luggage. The camera tripod supports the box for plein air painting (#4 lower left). With this setup I can paint on 8 x 10 inch panels. True luxury for me is to travel by car. I load the trunk with the items in #2, my Jullien half size French Easel and an umbrella (#5 lower right). Next week I’ll be walking the Camino de Santiago, or a least part of it, from Saint-Jean-Pied-de-Port to Pamplona. (#2 & #3). Enjoy the Camino de Santiago. I would love to hear about your experience. Thank you. I hope to bring back some good pictures (paintings!). Your walk sounds wonderful. Are you going to run with the bulls? We will be in Pamplona during the Festival of St. Fermin, but will be moving on before the bulls arrive.